Peter the Hermit leads the Peasants Crusade. Date and artist unknown. This is the third part in our weekly Fab Five Series, where I ask other bloggers, writers, podcasters and friends to give their five favorite historical figures. The criteria is up to them…so is the work! It’s hard to go past Peter the Hermit. You just don’t see people like him nowadays. Scruffy, dressed in rags, barefooted and using a donkey as his preferred means of transport, Peter also possessed the knack of galvanising the common person with his passionate speeches. He managed to convince tens of thousands of men, women and children to march to the Holy Land and to their ultimate doom, in the ill-fated Peasant’s Crusade. Why do I like him? Well, for being such an iconic figure of the Middle Ages for one, and also for the way he kept popping up unexpectedly in the narrative. But, to be honest, I’m not sure I’d actually want to meet him. He’s not really someone I’d like to sit down and have lunch with. Imaginary portrait of Guy of Lusignan, 1843. Artist unknown. This is another person I’d not really like to have lunch with. Yes, I’ve found King Guy very entertaining but there’s also something incredibly annoying about the man whose only positive traits are being good-looking and being descended from a water fairy. He was a mind-boggling incompetent monarch, yet seemed to be blissfully unaware of the fact. Really, you couldn’t have a worse candidate for the throne of a Kingdom which was at a pivotal point in its history and under constant Muslim attack. Zero experience as a soldier? Check. Total lack of talent for military command? Check. Utter inability to make a decision in times of crisis? Check. Easily intimidated by anyone who yelled at him? Check. Likely to lead his Kingdom to its doom? Check. Oh dear. Still, he has been a highly entertaining character. 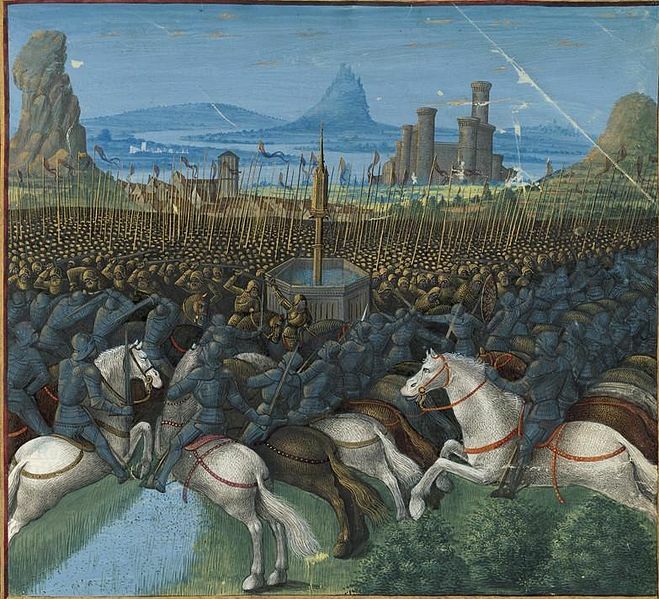 Miniature of the Battle of Cresson, Bibliothèque Nationale FR. By Jean Colombe, 1474. Now, when the military orders were established, no-one had ever seen anything quite like them before. And really, it was a bizarre concept – take a bunch of monks, seclude them in a monastry, arm them, feed them and teach them to fight, then order them to kill people in the name of the Church. The two things seem entirely incompatible – leading a monastic life of quiet Godly contemplation in between bouts of slashing Muslims to death. Later on, the Knights Templar became quite wordly and seemed to spend more time increasing their wealth and expanding their power base than acting like monks. But early on, they were very devout – spending their days in prayer in between bouts of military training. I’d like to sit down and talk to one of them, to understand how they reconciled their holy vows with their military duties. Although, since they weren’t allowed to come in contact with any women (and were also prohibited from bathing) I’m not sure it would be possible. Lunch? Probably not. 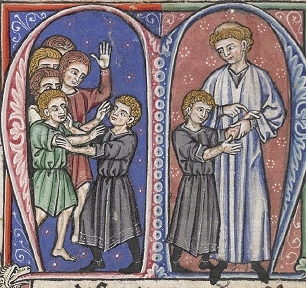 William of Tyre’s discovery of leprosy in the future Baldwin IV. Artist unknown, circa 1250. Ah, the Leper King. Has anyone ever been dealt such a dud hand in life as poor King Baldwin IV? Diagnosed with leprosy as a young heir to the throne, at a time when the disease was seen as a curse from God; elevated to the throne unexpectedly at a young age after the death of his father; cursed with a scheming mother and a silly sister, and forced to rule a fractured Kingdom just as Saladin was rising to power – the reign of the Leper King was beset by disaster upon disaster. Yet, despite crippling bad health, King Baldwin made the best of a bad situation. Allying himself with one of the few sensible noblemen in the Kingdom, Count Raymond III of Tripoli, Baldwin refused to lie back and let his illness have the better of him. For every minute of his short and painful life, he fought for his Kingdom. An admirable character? Yes. Lunch? Absolutely. Bohemond III and Raymond III at Jerusalem. Artist unknown, 13th century. Well, there you have it – my favourite Crusaders. If you haven’t done so yet and are interested in the Crusades – come and check out my podcast. Its free to download and you will be able to amaze all your friends with your knowledge of medieval warfare and the roots of the current conflict between Islam and the West! Woohoo! To check out more posts from the series visit its page here. It gives the rules for playing (none, really) and links to the previous posts. This entry was posted in Europe, Fab Five Series, Middle Ages, Middle East, Religion and tagged Count Raymond III, Crusader States, Crusaders, Crusades, History, History of the Crusades, Jerusalem, King Baldwin IV, King Guy, King Guy of Jerusalem, Knights Templar, Middle East, Military Orders, Peter the Hermit, Raymond III of Tripoli, Saladin. Interesting choices and a good read – I enjoyed it! She knows The Crusades. I love the podcast and was excited when she agreed to do a post. What about you, Andrew? Interested in doing one? It’s a tad facetious to say so, but technically Raymond III and Baldwin IV were not ‘crusaders’. They were, of course, rulers of the Latin East, but at no point did they ‘take the cross’ (thus becoming ‘crucesignatus’). Nevertheless, they were both exceptionally interesting characters, and Bernard Hamilton’s book ‘The Leper King’ is a wonderful insight into the period in which they were active. As for Guy, again I am not sure he ever took the cross, and also I think he has been wrongly maligned in history. 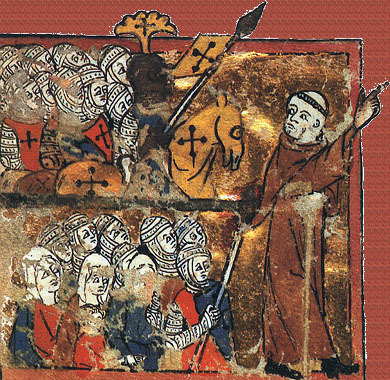 A recent article by Peter Edbury, as well as the seminal book on crusader warfare by Otto Smail, has demonstrated that what may be considered as military ineptitude, was actually the traditional tactic of the Latin East. 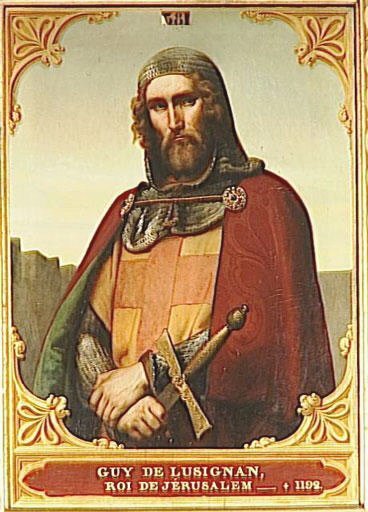 When in 1183 he was removed as regent for failing to meet Saladin in battle, he was merely following the tried and tested method of shadowing an enemy invasion force and not risking open battle (which was dangerous and expensive). When in 1187 he took the decision to leave Sephorie and go to Hattin, it was probably the sting of having been so heavily criticised for not risking battle 4 years earlier that convinced him. To call him inept I think is rather unfair. 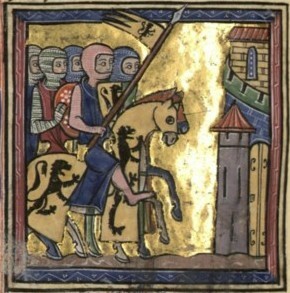 Also, it is somewhat ironic that Raymond III of Tripoli and Bohemond III of Antioch were the leading lights in the criticism of 1183 (and the former was to apparently urge caution in 1187) given that in 1164 they had chased Nur al-Din into a ravine at Artah (near Aleppo) and had both been captured whilst their army was butchered. Yes, I guess technically you’re right but the heading ‘ 5 Latin Christians involved in the Crusades’ is a bit unwieldy. I got criticised on my Facebook page for not including any Muslims in the list so I guess I’m not aiming to please anyone but myself here!